The sun is maize and the sky is blue, and the 2012 recruiting board lives here. The Brady Hoke recruiting wagon has headed westward, and picked up a great offensive tackle prospect on it's way. 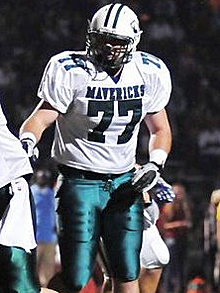 Carlsbad, CA native Erik Magnuson is the latest commitment to the 2012 class. It was long rumored that he would commit to the Wolverines...and the official word finally trickled out late Friday afternoon last week. "I just feel comfortable with the coaches, and I know them so well. I feel the program is going in the right direction. I know some of the 2012 commits and I think they're all good players. They're bringing in a good offense, and I want to get out of California. I just feel like Michigan is the right place for me." Just as an aside, not too many 17 year old's out there willing to say "I just want to get out of California...". However, as mgoblog points out, his first offer was from San Diego State...hence where he got to know the coaches so well. But as far as how this plays into the 2012 class, Erik ranks right up there with Terry Richardson and Royce Jenkins-Stone as the tops of the class. As you can see, his offer list is a typical who's-who of west coast CFB schools. He is a really nice pick-up for the class. As far as how many spots are left available in this class...according to Sam Webb on this morning's Michigan Insider on WTKA, there are 10 spots left. Plenty of room for some of the areas where we need some help.